Over the weekend of December 6-7, Fr. Eliseo Gonzalez, OAR, and fifty-eight parishioners from Our Lady of Pillar Church, Santa Ana, California, traveled to Sacramento to visit the Shrine of Our Lady of Guadalupe and to pray before the tomb of the Servant of God, Alfonso Gallegos, OAR. On Saturday December 6, after visiting the Shrine of Our Lady of Guadalupe upon arriving in Sacramento, the pilgrims visited the California State Capital Building, Bishop Gallegos Square and later attended the Holy Eucharist at Blessed Sacrament Cathedral, where Bishop Jaime Soto presided. On Sunday, the pilgrims attended the Holy Eucharist at Our Lady of Guadalupe Shrine and saw the exposition of the replica of the Holy Shroud of Turin and Old Town Sacramento and then returned to Santa Ana later that evening. 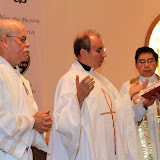 It was a pilgrimage of faith and joy and helped to continue promoting the life and works of our brother, the Servant of God, Alfonso Gallegos.